Claire Hutchinson, left, Nina Andersen, Daniel Levine, Kaylyn Moore and Kelsey Myers. 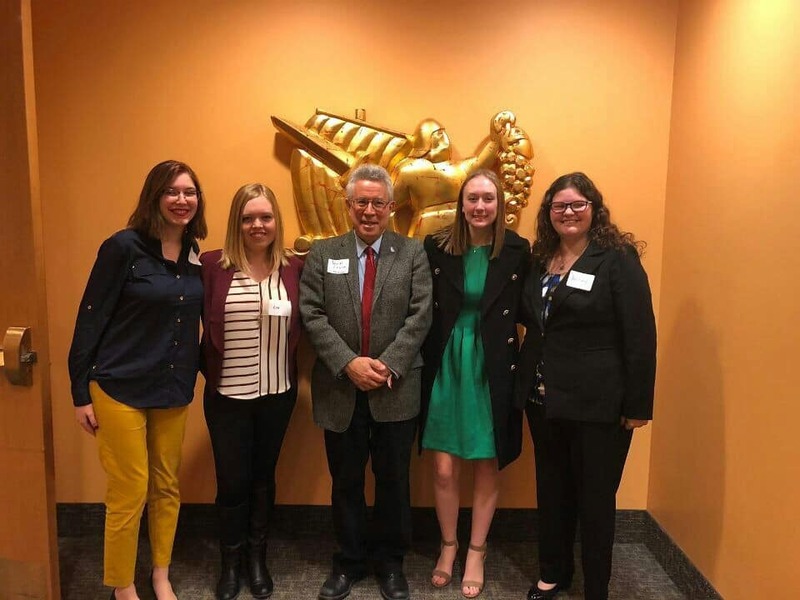 Four students of ancient Greek, Latin and Classical Studies from the University of Arkansas’ J. William Fulbright College of Arts and Sciences took home top honors from this spring’s national annual convention of Eta Sigma Phi, the Classics Honorary Society. During the conference at St. Olaf College in Northfield, Minnesota, the U of A team won the national Certamen Classics College Quiz Bowl, and one student on the team was elected to be Eta Sigma Phi’s national president. Undergraduates Nina Andersen, Claire Hutchinson, Kaylyn Moore and Kelsey Myers formed a Certamen team which they named RAZORBACCHAE and competed against eight other student teams in the double elimination competition. They answered questions about the Odyssey, Greek pottery and architecture, Latin and Greek vocabulary and grammar, mythology, Roman topography, and ancient weights and distances. The team received an accolade at the convention banquet, and scholarly books on classical antiquity, courtesy of the National Latin Exam. On the convention’s final day, honors student Nina Andersen, a junior classical studies and anthropology major, won the election to become the Megale Prytanis (National President) of Eta Sigma Phi, an office she assumed immediately, and in which she will serve until next year’s national convention at Carthage College in Kenosha, Wisconsin. U of A classical studies professor Daniel Levine, a Trustee of Eta Sigma Phi, and one of the faculty advisors for the local chapter, attended the convention and expressed pride in the U of A students’ accomplishments.